Before embarking on this review I wanted to check the meaning of soliloquy with my older child who is AP English literature inclined. I knew that the word had something to do with theater and literature in general, but she explained it in more detail giving me a Macbeth Shakespeare example. Soliloquy happens when suddenly, in the middle of the common scene, the light turns off on the whole crowd and spotlights on the main character who delivers a monologue to the audience oblivious to what is happening around him. From there you could guess where Swedish novice duo Soliloquium derives their name. They want to talk to the listeners alone, with spotlight on them, while the rest of world sits in the shadow. To do that Soliloquium employs something fitting under the rubric of melodic doomdeath. They have mastered and often resort to the watery twangy guitar sound and interplay it with heavy riffs bringing direct purposeful focus to the music (Chains, Catharsis). Periodically double bass punches through the watery float to arrive at a totally clean liberation moment (22). If analogy is needed, we don’t have to travel out of Sweden to describe Soliloquium sound. On one hand there is an unmistakable Katatonia brooding gloom, but there is melodic death riffy heaviness of the Orchid era Opeth. 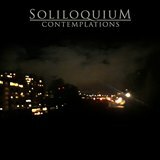 Thus oscillating from gloomy to angry, yet progressive and involved, Soliloquium maintains an interesting balance throughout most of Contemplations. Only In Affect goes for an overt striking funeral tone and Wanderlust is a sprawling tragic closing tune. There is also a soft underbelly to Contemplations with instrumental Streetlights and mostly instrumental For the Accursed. Bent notes of Streetlights grow disturbed, lurking on the edge of dark madness, and when the band is looking for relief from this insanity it only exacerbates the problem. The vocals on Contemplations are bottom of the pit scraping growl, a typical fare, but there are a few higher and blackened voices (Chains) as well as clean vocals. Clean crooning of Unfulfilling Prophecy leads to logical, in a sense, nebulous diffuse shoegazing shapes, something less structured than Katatonia rock. Contemplations don’t necessarily comes off as a depressing collection of songs. The album doesn’t jar you with pounding heaviness unnecessarily either. There is an appreciation of moodiness here without sticking to the cliché. American Daylight Dies or Swedish Slumber, which only managed one yet excellent Fallout, have similar effect on me.